The theoretical rationale for intervening in early childhood is that modifying internal and external risk and protective factors such as those discussed in the previous chapter can influence intermediate or proximal outcomes such as academic and other achievements; effective learning, competence, and skill development; and effective self-regulation. This in turn may reduce the exposure to drugs and the desire to use them during adolescence (see “Logic Model for Intervening in Early Childhood to Prevent Drug Abuse,”). 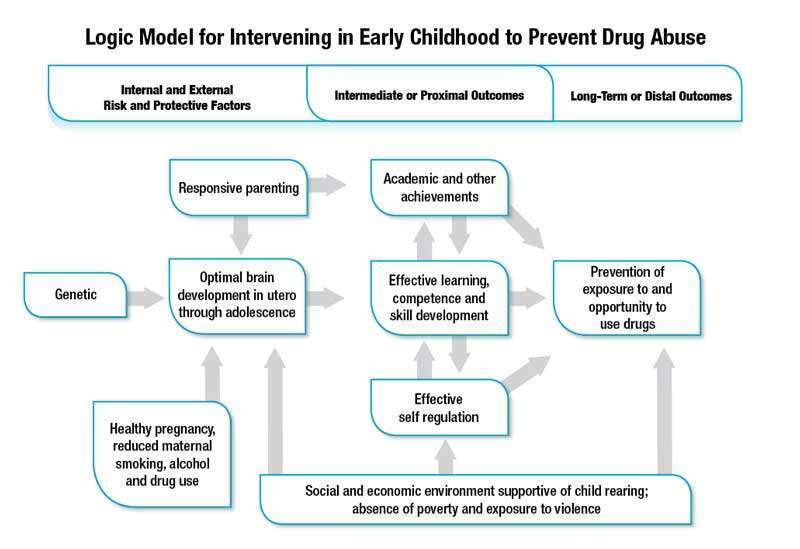 Text description: Logic model for intervening in early childhood to prevent drug abuse. Categories include internal and external risk and protective factors, intermediate or proximal outcomes, and long-term or distal outcomes. Internal and external risk and protective factors include responsive parenting, optimal brain development in utero through adolescence, genetic, and healthy pregnancy with reduced maternal smoking, alcohol and drug use. Intermediate or proximal outcomes include academic and other achievements, effective learning, competence, and skill development, and effective self-regulation. Long-term or distal outcomes include prevention of exposure to and opportunity to use drugs. Social and economic environment supportive of child rearing; absence of poverty and exposure to violence crosses all three categories. Arrows show connectivity between factors. Genetic, healthy pregnancy, responsive parenting, and social and economic environment supportive of child rearing lead to optimal brain development in utero through adolescence which leads to effective learning, competence and skill development. Responsive parenting also leads to academic and other achievements, which leads to effective learning, competence and skill development and prevention of exposure to and opportunity to use drugs. Effective learning, competence and skill development leads to effective self-regulation, prevention of exposure to and opportunity to use drugs, and academic and other achievements. Effective self-regulation leads to effective learning, competence, and skill development and prevention of exposure to and opportunity to use drugs. Social and economic environment supportive of child rearing leads to optimal brain development in utero through adolescence, effective self-regulation, and prevention of exposure to and opportunity to use drugs. Principle 3: Intervening early in childhood can have positive long-term effects. Principle 4: Intervening in early childhood can have effects on a wide array of behaviors, even behaviors not specifically targeted by the intervention. Prevention interventions have been shown to alter risk factors for families and children. For example, first-time, low-income mothers who received an intervention including home visits during pregnancy and the first two years of life (the Nurse Family Partnership, described in "Research-Based Early Intervention Substance Abuse Programs") had fewer child maltreatment reports involving them or their children 15 years after birth than mothers who did not receive home visits (Eckenrode et al., 2000). In another study, this home visiting intervention significantly reduced role impairment of mothers due to alcohol or substance use (i.e., impaired functioning with family members, with coworkers, and with friends) (Olds et al., 2010). For biological risk, a substance abuse prevention intervention for adolescent African American rural youth and their families (Strong African American Families), designed to strengthen family interactions, was found to be protective for children with genetic risk for initiating high-risk behaviors (Brody et al., 2009). Principle 5: Early childhood interventions can positively affect children’s biological functioning. Some of these early interventions have also been found to prevent a wide range of other negative behaviors and promote a wide range of positive behaviors not specifically targeted by the intervention. (See “Intervening Early Can Have Long-Term Effects on a Wide Array of Behaviors.”) In some cases, studies have shown that early childhood intervention even affected children’s biological functioning, such as their sensitivity to stress. What contexts do early childhood interventions target? Prevention interventions not only support children’s development directly but also support the development of skills and resources of those who care for children in their most important primary contexts—or what is sometimes called their proximal environments. Principle 6: Early childhood prevention interventions should target the proximal environments of the child. The proximal environment during very early development is the family, so prevention interventions for the prenatal through infancy and toddlerhood periods often focus on the parents. When providing an environment that supports healthy early development does not come naturally to new parents, prevention interventions can help them to build the necessary knowledge and skills. Family interventions may be delivered in the home, but that is not universally the case; some may be delivered in social service, community health, or educational settings. The family remains the most important proximal environment for children, but as a child grows and develops, other contexts outside the family become increasingly important as well. The classroom is an important environment during the preschool and elementary school years, and interventions may focus on things like improving school climate, resources, and policies as well as enhancing teachers’ skills and parent-teacher communication. Changing classroom environments from those that react to problem behavior to those that encourage pro-social behavior can be achieved through supporting teacher training in constructive classroom management strategies (see “School Interventions”). Programs targeting children making the transition to elementary school focus on building a repertoire of positive competencies including academic, self-regulation, and social skills. For example, tutoring, especially in reading, is one important focus of prevention programs because reading difficulties during the early elementary years is a strong risk factor for school failure and later drug use. Prevention intervention programs also target social skills that affect the children’s relationships with peers and adults outside the family. For example, some approaches used in programs that address social skills development include positive behavior teams, group practice, playground and free play monitoring, and rewarding good behaviors. Incorporating skills development into the natural environment of children allows them to practice these skills with peers. Another frequently used strategy for these interventions is training teachers in classroom management strategies. This approach provides teachers with both the skills for managing children’s behaviors and activities for teaching children to manage their own behaviors and emotions, thereby helping children develop self-regulation. Also, approaches that draw on mindfulness-based strategies (e.g., meditation, yoga, martial arts) are being developed and tested for their potential to enhance self-regulation. Principle 7: Positively affecting a child’s behavior through early intervention can elicit positive behaviors in other people, improving the overall social environment. Some interventions address multiple contexts such as family and school, with emphasis on communication and collaboration between the two environments, thereby making a consistent prevention effort across contexts to affect the target population(s) of the intervention. In fact, this is a primary strategy of interventions for children 3 years of age and older. Even when children are progressing along the normal course of physical, cognitive, social, and emotional development and achieving age-appropriate milestones, improvements in their proximal environments can further their development. Do early childhood interventions target all children or just those at highest risk? * An additional category, indicated interventions, has been defined by the Institute of Medicine (Institute of Medicine (1994). Reducing Risks for Mental Disorders. Washington, DC: National Academy Press) but is not relevant to early childhood. In the context of substance abuse prevention, indicated interventions are for individuals who already exhibit drug use but do not meet criteria for drug abuse or addiction. ** Universal interventions do not group high-risk participants, avoiding an environment in which those at elevated risk are set apart or stigmatized by their status. Moreover, many selective and tiered interventions more directly address the problems that a population is likely to encounter, however these interventions carefully consider such issues as stigma and the risks (e.g., modeling of negative behaviors) and benefits of grouping individuals from a subpopulation. 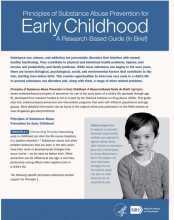 What are some characteristic features of early childhood interventions? Specific characteristics of early childhood intervention programs are generally related to the developmental period of the child, the specific risk to be addressed, and the people with whom the child interacts in his or her proximal environments. Interventions are generally timed to coincide with the transitions between life course periods, because changes occurring within and around the child during these transitions present particular risk factors, as well as opportunities for enhancing protective factors. (See “Risks Addressed Through Specific Age-Appropriate Strategies”). Prevention interventions for the prenatal period and infancy usually focus on very young mothers and families who are at risk due to poverty. The goal is to foster a healthy pregnancy, healthy development of mothers and their children, and a healthy parent-child relationship. Specific programs differ, but they commonly screen mothers for drug use, instruct them in good health care practices, and teach them how to connect to appropriate community services. Programs typically focus on mother-child bonding, using consistent discipline, setting an example of pro-social behavior, and getting the child ready for preschool. Involvement of the father is often encouraged as well. Some programs access mothers at home during the prenatal period. For example, in order to support mothers, nurse visitors may provide extensive one-on-one instruction during visits (Olds, 2002b). Other programs access mothers and their children through services for low-income families. This strategy supports finding mothers and children in need, assessing their needs, and referring them to available services and programs that meet those specific needs (Shaw et al., 2006). Core elements of a school-based early childhood intervention include training teachers to establish clear rules and rewards for compliance, teach interactively, and promote cooperative learning in small groups. Similar to programs for younger age groups, programs during the preschool period address the well-being of both caregivers and children and the quality of their relationship, primarily through teaching pro-social parenting practices. Early disruptive behaviors of children are addressed in order to prevent escalation of these behaviors, promote better parent-child bonding (Webster-Stratton et al., 2008), and help the child learn positive ways of relating to others. Preschool programs can incorporate much of the same content as programs for younger age groups (for example, encouragement of pro-social child behavior and consistent contingent-responsiveness and non-abusive limit setting) but within very different contexts (such as school) and with children who have a wide variety of risk factors. Preschool is a point in time when many children are at risk for or entering child protective placements (Child Welfare Information Gateway, 2013), and these children are at increased risk for multiple problems early and later in life. Thus some interventions specifically target foster parents and children. For example, in the Multidimensional Treatment Foster Care Program for Preschoolers (MTFC-P), maltreated foster children receive individualized services in the home, a preschool setting, and a therapeutic child play group; and foster parents are given training to ensure that they are properly equipped to care for children who may come to them with symptoms of severe stress and unusually difficult behavior challenges. A significant target of programs aimed at the transition to elementary school is creating strong collaborative ties between families and schools. Evidence indicates that such links facilitate children’s adjustment to school, academic achievement, pro-social peer friendships, and self-regulation. A notable characteristic of programs targeting this period of development is the use of interactive techniques such as role-playing, guided play sessions, and small-group practice; research has demonstrated that interactive techniques are more successful than lecture and information only (Tobler, 2000). A number of programs focus on improving communications between parents and teachers and on providing parents with information and strategies for helping their child cope with the structure and behavioral expectations of the classroom and how to facilitate positive peer interactions. Research shows that parents can help their children develop skills, competencies, and knowledge specific to the school transition and thereby promote a child’s school success. The elementary school is also a focus of interventions to develop children’s school competencies. At the heart of these programs are activities that build a repertoire of positive academic, self-regulation, and social skills. Programs may include tutoring—especially in reading, as reading difficulties in early elementary school is a risk factor for ongoing academic problems and later school failure and drug use. Even if they target similar outcomes, programs may use different strategies: For example, social skills development can be approached through positive behavior teams (seating children with social or behavioral problems with more competent children) (Ialongo et al., 1999), group practice, playground and free-play monitoring, or rewarding of good behaviors. Teachers are also a focus of interventions for this developmental stage. In such programs, teachers are frequently trained in classroom management strategies. Core elements of a school-based early childhood intervention include training teachers to establish clear rules and rewards for compliance, teach interactively, and promote cooperative learning in small groups. Such an approach is designed to provide teachers with both the skills for managing child behavior and activities for teaching children to manage their own emotions and behaviors, thereby helping children develop self-regulation. How does changing the behavior of parents and teachers help children? In programs that target multiple actors (such as parents and teachers, or parents and children), the program activities for one actor often reinforce those of another. For example, parents who are taught to respond with consistency and a matter-of-fact, warm tone when their child breaks a rule are likely to elicit a positive change in child behavior. Thus, a program to reduce aggressive behavior in children entering school could include activities and training in classroom management for teachers and instruction in supportive, consistent, contingent-responsive parenting strategies for parents and other caregivers, as well as child-oriented program components aimed at increasing the child’s attention and self-regulation within the classroom environment. Behavioral changes in children and the adults who interact with them can be mutually reinforcing. By positively influencing the child’s family or school environment, child behavior can, over time, become more pro-social; this, in turn, can elicit more positive interactions with caregivers and peers, and thereby improve the social environment. Who benefits the most from early childhood interventions? While most children and families benefit from interventions, children at increased risk for later substance abuse due to factors such as early aggressive behavior, poor emotional control, or extreme poverty, generally benefit the most from early childhood interventions. In addition to children, there is evidence that mothers benefit from the parenting interventions. For example, several studies have shown positive effects on maternal depression, substance use, education, and career attainment. August GJ, Hektner JM, Egan EA, Realmuto GM, Bloomquist ML. The Early Risers longitudinal prevention trial: examination of 3-year outcomes in aggressive children with intent-to-treat and as-intended analyses. Psychol Addict Behav. 2002;14(4, Suppl):S27-S39. Brody GH, Chen YF, Beach SR, Philibert RA, Kogan SM. Participation in a family-centered prevention program decreases genetic risk for adolescents' risky behaviors. Pediatrics. 2009;124(3):911-917. Child Welfare Information Gateway. Foster Care Statistics, 2011. Washington, DC: Child Welfare Information Gateway, 2013. Conduct Problems Prevention Research Group. Evaluation of the first 3 years of the Fast Track Prevention Trial with children at high risk for adolescent conduct problems. J Abnorm Child Psychol. 2002;30(1):19-35. Dishion TJ, Brennan LM, Shaw DS, McEachern AD, Wilson MN, Jo B. Prevention of problem behavior through annual family check-ups in early childhood: intervention effects form home to early elementary school. J Abnorm Child Psychol. 2014;42(3):343-354. Dolan LJ, Kellam SG, Brown CH, et al. The short-term impact of two classroom-based preventive intervention trials on aggressive and shy behaviors and poor achievement. J Appl Dev Psychol. 1993;14:317-345. Eckenrode J, Ganzel B, Henderson CR, Jr, et al. Preventing child abuse and neglect with a program of nurse home visitation: the limiting effects of domestic violence. JAMA. 2000;284(11):1385-1391. Eddy JM, Reid JB, Stoolmiller M, Fetrow RA. Outcomes during middle school for an elementary school-based preventive intervention for conduct problems: follow-up results from a randomized trial. Behav Ther. 2003;34(4):535-552. Fisher PA, Stoolmiller M. Intervention effects on foster parent stress: associations with child cortisol levels. Dev Psychopathol. 2008;20(3):1003-1021. Furr-Holden CDM, Ialongo NS, Anthony JC, Petras H, Kellam SG. 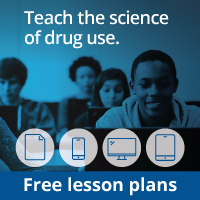 Developmentally inspired drug prevention: middle school outcomes in a school-based randomized prevention trial. Drug Alcohol Depend. 2004;73(2):149-158. Hawkins JD, Kosterman R, Catalano RF, Hill KG, Abbott RD. Promoting positive adult functioning through social development intervention in childhood: long-term effects from the Seattle Social Development Project. Arch Pediatr Adolesc Med. 2005;159(1):25-31. Izzo C, Eckenrode J, Smith E, et al. Reducing the impact of uncontrollable stressful life events through a program of nurse home visitation for new parents. Prev Sci. 2005;6(4):269-274. Kellam SG, Brown CH, Poduska JM, et al. Effects of a universal classroom behavior management program in first and second grades on young adult behavioral, psychiatric, and social outcomes. Drug Alcohol Depend. 2008;95(Suppl 1):S5-S28. Kellam SG, Rebok GW, Ialongo N, Mayer LS. The course and malleability of aggressive behavior from early first grade into middle school: results of a developmental epidemiologically-based preventive trial. J Child Psychol Psychiatr. 1994;35(2):259-281. Lunkenheimer ES, Dishion TJ, Shaw DS, et al. Collateral benefits of the Family Check-Up on early childhood school readiness: indirect effects of parents’ positive behavior support. Dev Psychopathol. 2008;44(6):1737-1752. O’Donnell J, Hawkins JD, Catalano RF, Abbott RD, Day LE. Preventing school failure, drug use, and delinquency among low-income children: long-term intervention in elementary schools. Am J Orthopsychiatry. 1995;65(1):87-100. Olds DL, Eckenrose J, Henderson CR, Jr., et al. Long-term effects of home visitation on maternal life course and child abuse and neglect. Fifteen-year follow-up of a randomized trial. JAMA. 1997;278(8):637-643. Olds DL, Henderson CR Jr., Tatelbaum R, Chamberlin R. Improving the delivery of prenatal care and outcomes of pregnancy: a randomized trial of nurse home visitation. Pediatrics. 1986;77(1):16-28. Olds DL, Henderson CR Jr., Tatelbaum R, Chamberlin R. Improving the life-course development of socially disadvantaged mothers: a randomized trial of nurse home visitation. Am J Public Health. 1988;78(11):1436-1445. Olds DL, Henderson CR, Jr., Cole R, et al. Long-term effects of nurse home visitation on children’s criminal and antisocial behavior: 15-year follow-up of a randomized controlled trial. JAMA. 1998;280(14):1238-1244. Olds DL, Henderson CR, Jr., Kitzman H. Does prenatal and infancy nurse home visitation have enduring effects on qualities of parental caregiving and child health at 25 and 50 months of life? Pediatrics. 1994;93(1):89-98. Olds DL, Robinson J, O’Brien R, et al. Home visiting by paraprofessionals and by nurses: a randomized controlled trial. Pediatrics. 2002;110(3):486-496. Olds DL, Robinson J, Pettitt L, et al. Effects of home visits by paraprofessionals and by nurses: age 4 follow-up results of a randomized trial. Pediatrics. 2004;114:1560-1568. Petras H, Kellam SG, Brown CH, Muthen BO, Ialongo NS, Poduska JM. Developmental epidemiological courses leading to antisocial personality disorder and violent and criminal behavior: effects by young adulthood of a universal preventive intervention in first- and second-grade classrooms. Drug Alcohol Depend. 2008;95(Suppl. 1):S45-S59. Poduska JM, Kellam SG, Wang W, Brown CH, Ialongo NS, Toyinbo P. Impact of the Good Behavior Game, a universal classroom-based behavior intervention, on young adult service use for problems with emotions, behavior, or drugs or alcohol. Drug Alcohol Depend. 2008;95(Suppl. 1):S29-S44. Reid MJ, Webster-Stratton C, Hammond M. Enhancing a classroom social competence and problem-solving curriculum by offering parent training to families of moderate- to high-risk elementary school children. J Clin Child Adolesc Psychol. 2007;36(4):605-620. Shaw D, Connell A, Dishion T, Wilson M, Gardner F. Improvements in maternal depression as a mediator of intervention effects on early childhood problem behavior. Dev Psychopathol. 2009;21(2):417-439. Stoolmiller M, Eddy JM, Reid JB. Detecting and describing preventive intervention effects in a universal school-based randomized trial targeting delinquent and violent behavior. J Consult Clin Psychol. 2000;68(2):296-306. Storr CL, Ialongo NS, Kellam SG, Anthony JC. A randomized controlled trial of two primary school intervention strategies to prevent early onset tobacco smoking. Drug Alcohol Depend. 2002;66(1):51-60. Tobler NS. Lessons learned. Journal of Primary Prevention. 2000;20:261-274. Wang Y, Browne DC, Petras H, et al. Depressed mood and the effect of two universal first grade preventive interventions on survival to the first tobacco cigarette smoked among urban youth. Drug Alcohol Depend. 2009;100(3):194-203. Washburn I, Acock A, Vuchinich S, et al. Effects of a social-emotional and character development program on the trajectory of behaviors associated with social-emotional and character development: findings from three randomized trials. Prev Sci. 2011;12(3):314-323. Wilcox HC, Kellam SG, Brown CH, et al. The impact of two universal randomized first- and second-grade classroom interventions on young adult suicide ideation and attempts. Drug Alcohol Depend. 2008;95(Suppl. 1):S60-S73.